A quarter mile east of the Camino Real Bridge is an inlet between the Intracoastal Waterway and the Atlantic Ocean. The Boca Inlet Bridge carries FL-A1A (Ocean Blvd.) across the inlet. Its a 540 ft long trestle on concrete piles with a single bascule leaf over the channel. The bridge is in satisfactory condition (sufficiency rating of 65.5) and carries 11,200 vehicles a day. The vertical channel clearance is 23 feet (at high tide) and the channel width/lateral clearance is 45 feet. The bridge is owned by the State of Florida and opens by horn signal (one long and one short) or by hailing the bridge tender on VHF Channel 09 (all movable bridges in the State of Florida can be hailed on Channel 09). 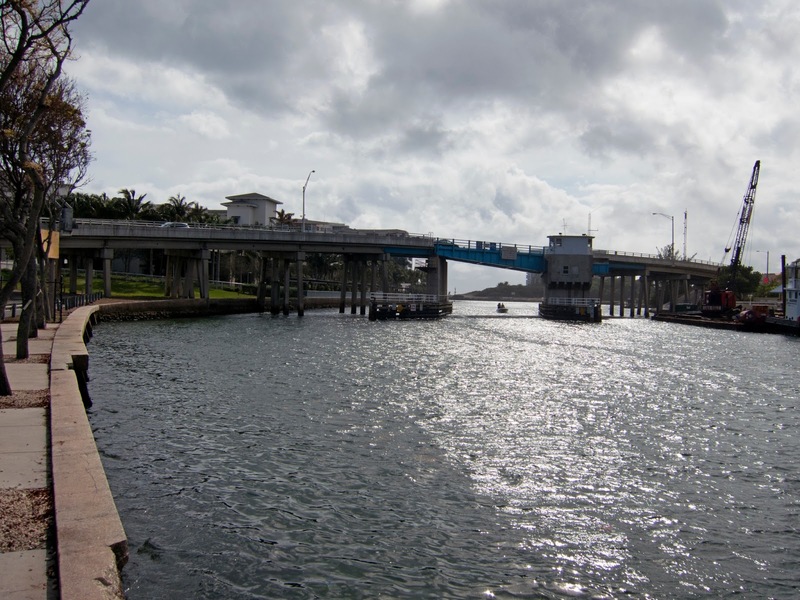 Palm Beach County, Florida Bridges: Boca Inlet Bridge by Mark Yashinsky is licensed under a Creative Commons Attribution-NonCommercial-ShareAlike 3.0 United States License. Thank you so much for this kind of informative sharing about this bridge..In the last Saturday we were going at florida to visit this beautiful city....At this place we saw a florida bridge that was actually places in the Intracoastal Waterway and the Atlantic Ocean...This bridge is so long,i'm so happy to find some interesting things about this bridge through in this site..So thanks for this unique sharing...! !